Yes that is true if you are traveling together. The rules say you must have marriage certificate with you and I know some will say no one asked but to make life easy follow the rules. Not my business, but surely it would be far more advantageous for you both in the long run, if your fiancee could somehow both give care to her mother AND continue with her green card/citizenship process ? You may both regret not having seized the opportunity, further down the line. Make sure you are in the same line together and TELL the agent that you two are married. Years ago I had to go to BI and get my stamp amended cuz the guy put a tourist stamp instead of Balikbayan. My fault. I just didn't know. Good luck and have fun! TELL the agent that you two are married. Yes, I totally understand her desire to be with her mother... of course. I'm just questioning the wisdom of 'burning bridges' with the U.S. Citizenship process though... if that were to be the case. I know how complicated and expensive the equivalent British system is. I read that you can extend the Balikbayan visa, I was wondering if at the one year point my wife and I took a trip and returned, could we get another 12 month Balikbayanvisa? Anyone have experience with this. 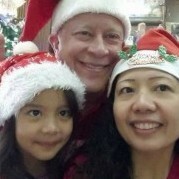 My wife's US visa can take around 18 months and we want to stay together as a family while our daughter learns some Tagalog. Thanks.